It has been a great start to 2018 for Police Dog Hogan when in the midst of their successful February and March tour ‘Devon Brigade’, from last year’s album ‘Wild By The Side Of The Road’, was nominated for the UK Song Of The Year in the Americana Music Association Awards 2018. Kairen Kemp and Iconic PR are proud to have been part of the journey. Police Dog Hogan, first formed in 2009, has evolved over the years into a tight-knit seven-piece band combining guitar, fiddle, banjo, mandolin, accordion, trumpet, keyboards, bass and drums. 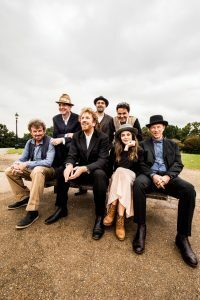 The band has repeatedly been offered headline and other spots on the main stages of numerous key festivals and this year will be no different including the fourth year at Cornbury and Cropredy.